Able to accommodate up to 14 people the 2400 square foot Ranch House has four bedrooms, 2 ½ bathrooms, a spacious front entry, and an open concept living / dining room with cathedral ceiling, massive 18 foot high stone fireplace and loads of windows. A bright working kitchen with pine cupboards overlooks the spacious rear deck, flower gardens and stone Barbeque / Smoke House. The dining room is twenty-three feet long with cherry hardwood flooring and a patio door to the deck. A ten-foot long table that comfortably seats twelve people is perfect for formal dining. 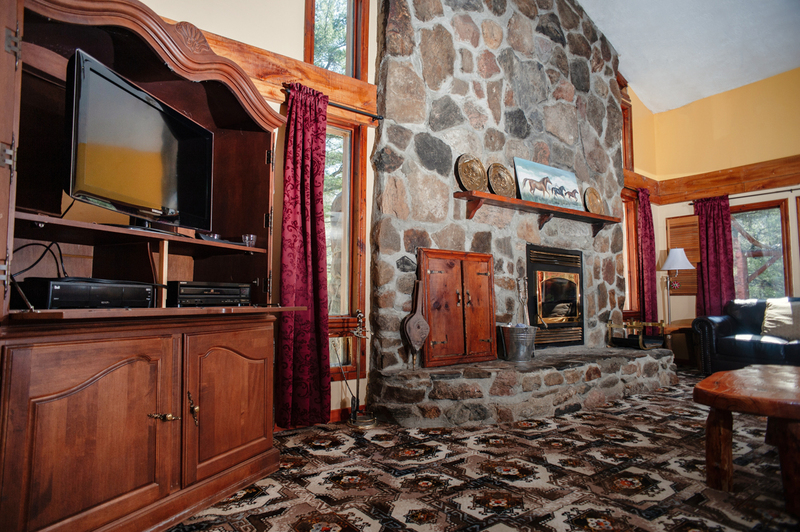 One step up, the living room’s focal point is the stone fireplace. Cathedral ceilings, large windows and a Romeo and Juliette balcony make this a special setting. Fireplace, Telephone for local calls, VCR, Fully equipped Kitchen, Microwave, Dishwasher, Refrigerator, Washer & Dryer, Jetted Tub in Bath, Gas Grill BBQ. Beach is a 200 yard walk. Holiday Rates not included. Monthly rates negotiable. Daily & weekend rates on request, available during low season. Note: Until confirmed, rates are subject to change without notice. Catering can be arranged for group events. Available during low season, rates on request.